A rounded, spreading tree with smooth gray bark. 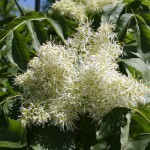 In late spring, white sprays of fragrant white flowers in clusters emerge. The summer foliage is medium green, the fall color is yellow with tinges of purples. The seeds may hang on until winter. 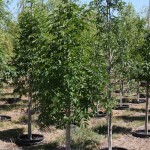 It prefers full sun, and moist, fertile soils, but is tolerant of a range of soil pH and poor drainage.